Me again. I’ve come back to ramble off my thoughts. I have a new topic to blog about today, thanks to my favorite blogger Joy Clarkson. She said that if anyone has a blog, vlog, or other “media sharing device,” to post all the months of the year to reflect and give thanks. January, 2014. The phrase brings back a whole lot. To start, we had just moved to California to sell a house. My Dad, out of the generosity of his heart (and mother’s prodding, I’m sure), bought us Disneyland passes for Christmas. We went as often as we could, and I can tell you without a doubt that I had a fabulous time! During the first month of the new year, we stayed in a hotel in Long Beach, CA. I thought that this would mean a somewhat vacation, but I was so wrong. Mom brought curriculum! So, schooling in a hotel was a challenge, and Dad was away working in an office. I definitely had to step out of my comfort zone for this one. After about 2-3 weeks, we all came down with a bad California sickness. I felt sorry for the housekeeper who cleaned our room. February was our second month in the hotel, and also the month of my birthday. I’ts weird to think that I was eleven last year and I’ll be thirteen this year! SO WEIRD! The weather is warm or hot 99% of the time, which requires shirts, tanks, shorts, and swimsuits. Which made us go to the beach more often! That was fun. But, sometimes the sewer spills in Orange County…yuck. In March we moved into the house that needed to be sold. I have to be honest with you, it was a disaster. My grandmother helped us clean, and after we finished, my feet were black. And, we still weren’t done. New carpet, new vanity for the bathroom, and intense bathroom cleaning. After a while, the house was ready to be sold. During the long months of April and May, we stayed in the little town home until about the last too weeks of May, when we moved into a hotel in Los Alamitos. We went to Disneyland more than ever in that time, and it was exciting. News from the Realtor came, and the house had sold. I was so excited! We could go home! We packed up as fast as we could, said our goodbyes (i love all you peeps) and headed back to our mountain of a home in Colorado! It was a cold wet summer when we arrived back home, and when we entered the city limits, it was raining; at midnight. We were cold, tired, and thankfully, there was room at the inn :). We stayed in the hotel for about a week or two, and everyday we went to the library and drove by our little ranch house (which was currently being rented out). Since it was summer, we went to our favorite ice cream parlor, took walks in the park with our dogs (I think they were glad to be home, too). When the long two weeks were over, I never wanted to see a hotel again! We were home, and the first thing I did was run down the driveway, hug the trees (I am no hippy), and explode into the house and scream at the top of my lungs for joy at being home. I smelled the smell that only my house smells like. I know that sounds weird, but it is so true. Summer in Colorado is like nowhere you’ve ever been. It’s just incredible. My little sister, Allison’s birthday was in August, and we had a Hobbit themed family party! The night we had a camp-out up in the tree house. If you’ve never camped in a tree house, do it. Very cold, very dark, very creepy; especially with summer mosquitoes. We took some dorky pictures using my weird photo editor. I would show you, but mom says the pictures are too weird. August was also a month of discovery for me. I learned how to canter and use split reins (horse lingo), and I was introduced to the books the changed my life: The Lord of the Rings. 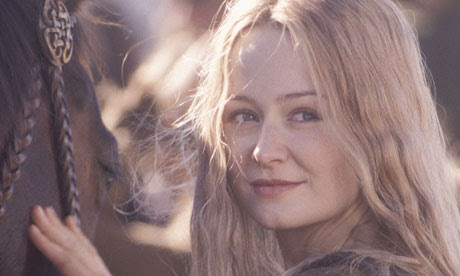 My favorite character is the Lady Eowyn :). During these months, everything seemed normal, and I felt back in the groove. Enough said. This time of year what I am thankful for is family and snow. To have your family with you is the best feeling in the world. To feel the love, the grace, and hearing noises people outside of the house don’t get to witness :D! My family is the best thing that ever happened to me, along with Christ. I love my life, my friends, all you readers, my dogs, my horse, my God, my family. I praise God for the year that I have had and all that I have been given. I hope that you all feel inspired and give thanks to God for your year! Emily 😀 P.S. I passed on Joy Clarkson’s message, so pass it on!